Resource Tuner: Resource Editor, Automatic UPX Unpacker, Resource Optimizing, Resource Error Checking and Repair. I could possibly find freeware to do this task, but I wouldn't in general trust freeware for business purposes. The reason I chose Resource Tuner was simply that it works - I had previously been using Borland's Resource Workshop for my work, which is (non-commercial) localisation, but I had been having difficulty using it with Far Eastern locales. The evaluation version of Resource Tuner, on the other hand, worked perfectly, and I was startled at how cheap it was to register (I would normally expect to pay at least twice as much for a program of this quality). 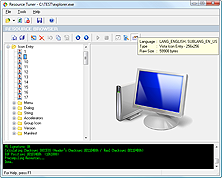 Resource Tuner offers a thorough look at all of the resources (bitmaps, jpeg, icons, strings, dialogs, PNG, PNG compressed Vista icons, XML, Image Lists, Type Library, version information) in the compiled executable file, and allows you to make modifications without needing to recompile the source code. Working with 32- and 64-bit PE files such as .EXE, .DLL, binary RES, Device Drivers (.SYS, .ACM), ActiveX Controls (.OCX), Borland Libraries (.DPL and .BPL), XP Visual Styles (.MSSTYLES), Control Panel Extensions (.CPL), Screen Savers (.SCR) and any other win32 executables. Automatic UPX Unpacker. Now you can open files compressed with UPX even without knowing that: your file will be unpacked automatically! Support is provided for nearly every type of resources imaginable. The only one that can work with PNG, XML, Image Lists, and Type Library. Saving multiple resources to disk at once. No more manual repetitive tasks! Windows executable files (EXE, DLL, ActiveX controls) can have all sorts of resources buried within them. Resource Tuner enables you to get at them to modify, save or delete them. Resources include the applications graphics, icons, cursors, dialog boxes and text. Resource optimizing, error checking and repairing automatically performed when opening a file. Application Manifest Wizard inserts the manifest resource in existing applications - an easy way for legacy applications take advantage of the new look for common control styles on Windows XP and Vista, and run elevated as Administrator on Windows 7 or 8. Expandable! Support for custom plug-ins to perform any startup processing. You can navigate easily through the Delphi forms, RCData, and objects, and view their contents (Image Lists, Strings List, Glyphs, Bitmaps). There's a very strong emphasis on peeking inside Delphi applications and packages. More features — pick up your free trial to see them all! Resource Tuner takes care of the things the other programs don't cover. With this Resource Editor you can focus on the goals you want to achieve, rather than on the oddities of your resource hacking tool. Resource Tuner is packed with features which make it an essential tool for anyone tweaking another programs. Once you try it, we think you will find it hard to go back to other resource hacking utilities. Don't take our words for granted, see What Users Say.